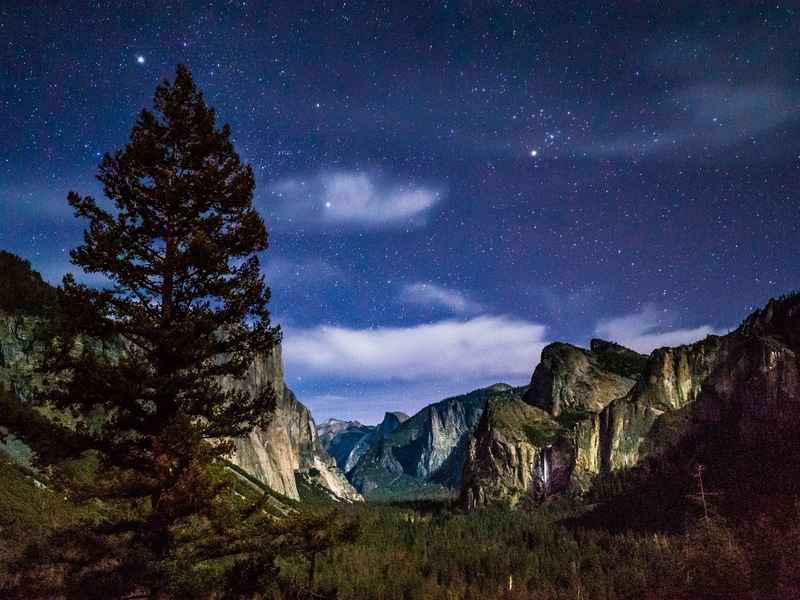 "I think I can get a good photo of the valley and the stars using a long exposure." "Fifteen seconds ought to be good, I figure." "No, I mean how long are we going to be here?" By now we've established that a full frame camera with 24mm f/1.4 lens is my favorite setup for night landscapes and starscapes. 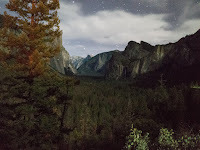 And if we find ourselves looking out over a valley under a brilliant night sky, and if I mistakenly left the lens - and the tripod - back at the hotel, I can capture the scene almost as well with a good pocket camera. Another thing we've learned is that watching someone else take pictures is really boring. 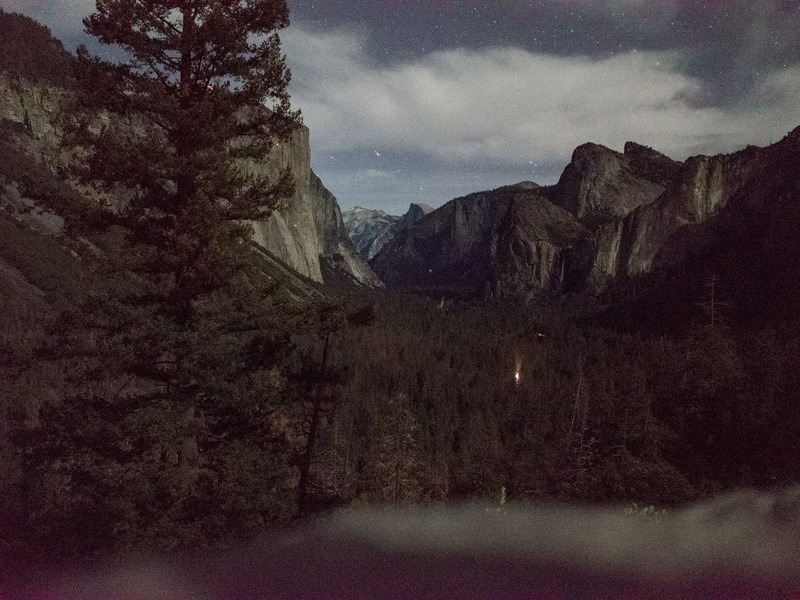 It had been a long day, up Four Mile Trail to Glacier Point, then back down to the Alwhanee, er Majestic Hotel in time for dinner and a sunset. We were driving back when we passed Tunnel View. We both noticed a crowd of people milling about in the darkness. "Hey look, lots of people checking out the view. In the dark." "Want to go see the dark view?" And we pulled in. Plenty of parking available, and as our eyes adjusted to the darkness a beautiful dome of stars revealed itself. A crescent moon illuminated the landscape. We stood in awe. 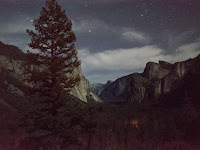 And that's when I realized I'd forgotten to bring the astro lens and tripod. No matter, I have two good cameras with me, the Canon 6D with ultra-wide zoom in the trunk of our car with my backpack, and my Ricoh GR compact, in my pocket as always. I figured the GR has an ASP-C sensor - same as you get in most DSLRs - and a relatively fast and wide lens. Being on hand, the GR became my choice. It also has a flat bottom suitable for propping up on a rock wall. So I prop it up, and after a few minutes of fiddling, I'd captured the night scene as we remember it. Pointing the camera further north - or south - closer to the celestial pole where the apparent motion of the stars is faster, allows more open shutter time, while for me some of the more interesting stuff (Orion, Milky Way core, and so on) is near the equator where there's less time. So with the same setup I might use a 20 second exposure for Cassiopeia, and 15 seconds for Sagittarius. Aperture? As wide open as possible, stopping down just enough to make sure the corners are sharp. ISO? How much can your sensor take before getting noisy? That's something you'll learn from trial and error, experimentation, and photo discussion groups. For example, my Ricoh GR has an equivalent field of view of 28mm and 15 seconds will get plenty of light and limit star trails. With the 6D I usually go for a sensor speed of ISO 3200 or even 6400 (I once got a spectacular black and white at 25,600 camping under the milky way at high altitude and crystal clear skies) but the GR is a lot cleaner at 1600. 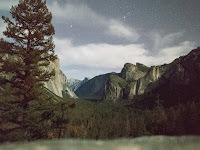 So 15 seconds at ISO 1600 and f/2.8 is my go-to setting under dark skies. There's a few numbers you have to learn, but once you learn them, you can pretty much set the exposure the same way every time, and you'll get a feel for adjusting this for different conditions... moonlight, car headlights, clouds, and so on. With experience you'll learn what works. The last thing everyone wants is to stand around while you fiddle endlessly with a complicated camera. You should be able to set up and take this shot in the same amount of time it takes to organize people into a group photo. One skill you absolutely need to master is manual focus. Again, the Internet has great resources and how-to articles. The short answer is to focus on a bright star using the camera's LCD screen at maximum zoom. If you're using a fully manual lens you can even mark the spot on the focuser. Infinity will be in the same place every time. 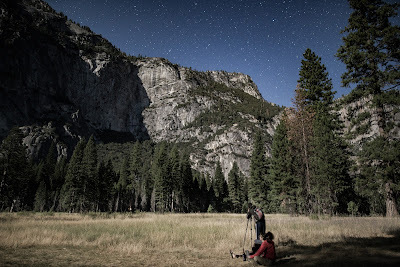 The next challenge of photographing in a dark environment is simply pointing the camera. When it's a dark night, your LCD screen is solid black, making adjustments tricky. Even with a pentaprism DSLR, it can be difficult to see what's in the corner of the frame. So how do we frame the shot? Trial and error. In the following sequence you see a number of photos where I take the picture, look at it on the camera's LCD screen, and move the camera in a direction and amount that is basically a best guess. Obviously if each picture is a 15 second exposure, this can take a long time, right? So, we can fix that. Instead of using the camera's optimal settings, crank up the ISO to maximum and shorten the exposure time to a few seconds. The pictures will be noisy as all get out, nothing you'll want to show off, but they will let you see the composition of the shot and quickly zero in on the picture you want. Once you have it framed, put your settings in the optimal mode for that final shot. With some post processing and noise reduction, you might find you have a picture you'll be proud to hang in the living room or share on your social face gram. The final skill for taking these pictures, for taking a picture like you would any vacation snapshot, is most critical. You must be able to do all of the above, quickly, in the dark. Forget to focus? The shot is ruined. Auto ISO? Ruined. Switching to the wrong exposure? Accidentally push the wrong button because it's dark? Forget it. You should be able to say, "Wow, look at that sky," get out your camera, focus, adjust the framing with quick shots, and reset the exposure for your final picture, all before your friends and family get tired of waiting for you. Not that sitting under the stars is the worst burden you could impose on them! But the more you're there and present for the people around you, rather than just obsessing with your camera, the better for everyone. Nobody does anything perfectly the first time. It takes practice, it takes attention to detail, it takes constant self-improvement. A hobby is something you spend time on, and this is a good one. So next time there's a meteor shower, invite your friends to spend a night out in the woods watching shooting stars. Bring a picnic basket. While everyone is ooh-ing and ahh-ing at the celestial show, you'll have all the time you need.